A perfect culinary teaching tool! 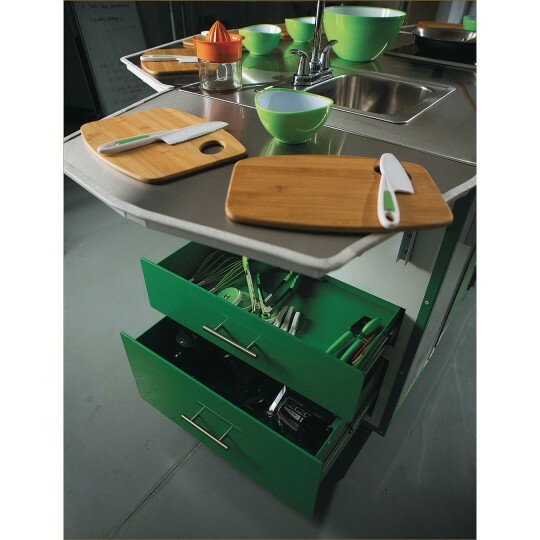 Turn just about any space into a dream space to teach hands on cooking lessons! Allows for 10 students to chop, sauté, and bake their way to fun and nutritional cooking! Measures 55”L x 46”H x 31-1/2”W and weighs 450 lbs. 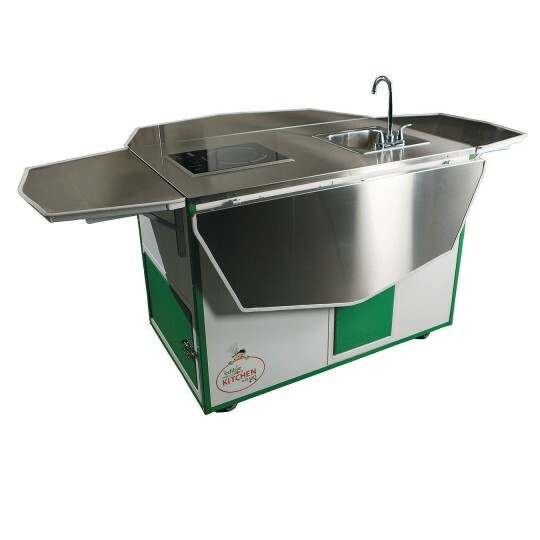 The FIRST, interactive, mobile culinary cart that can turn just about any space into a dream space to teach hands on cooking lessons! 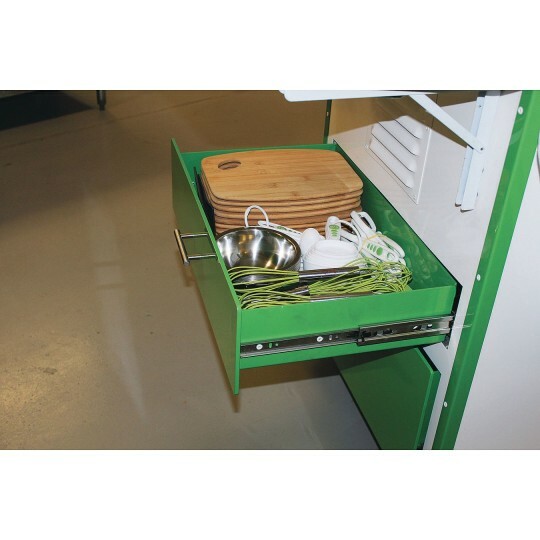 Compact and sleek, the Kitchen a la Cart™ rolls through doorways into any room where the sides are then flipped up, allowing for 10 students to chop, sauté, and bake their way to fun and meaningful nutrition, food and cooking lessons. 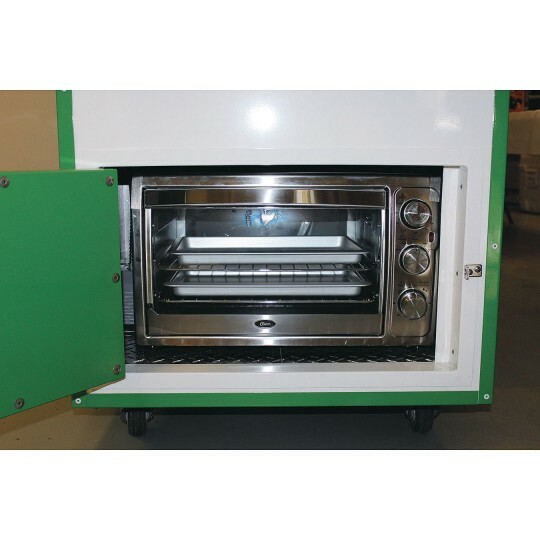 This Culinary Cart is complete with a built-in sink with hot and cold running water, an induction burner that allows for kids to cook without some of the risks of a conventional burner, a large, counter-sized convection oven housed in its own cooking and storage space, and drawers that store all the tools and accessories necessary for hands-on, cooking fun to begin! The Kitchen a la Cart™ ships in a heavy-duty wooden crate. One side of the crate folds down and creates a ramp in order for the product to easily and safely be removed. A separate Crate & Handling fee does apply. All of the included cooking utensils are BPA free and adhere to all US & FDA safety standards. The Kitchen a la Cart™ runs on two – 110 volt outlets, it measures 55”L x 46”H x 31-1/2“W and weighs 450 lbs. on 4 independent wheels.